IS AGAVE NECTAR HEALTHIER For Us? 1.Agave Syrup is not a "whole" food. It is a fractionated and processed food. the liquid portion of the agave plant is "boiled" down, which concentrates the sugar to make it sweet, thus the Agave Syrup is missing many of the nutrients it original plant began with. 2.When Agave Syrup ferments, the enzymatic activity MUST be stopped so that the syrup will not turn into tequila in your cupboard. There is no enzymatic activity, it is certainly not a "live" or RAW food - as the label states Raw Agave. 3. Agave Syrup is advertised as "low glycemic". It's marketed towards diabetics, which can lead to health issues. 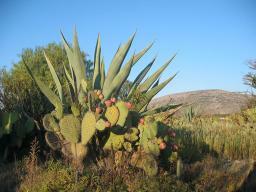 Yes, agave itself is low glycemic. It is due to the unusually high concentration of FRUCTOSE SUGAR (90%) compared to the small amount of glucose (10%). 4. Agave Syrup and other concentrated sweeteners are addictive, so you end up trading a cooked addiction (eating candy bars or cookies) for a "raw" addiction which is not much better. 5. Agave nectar raises blood sugar just like any other sugar. Fructose appears to interfere with copper metabolism. Collagen and Elastin unable to form. Collagen and elastin are connective tissue which essentially hold the body together AND keep it longer younger. A deficiency in copper leads to bone fragility, anemia, defects of the arteries and bone, infertility, high cholesterol levels, heart attacks and ironically enough an inability to control blood sugar levels. Fructose actually promotes disease more readily than glucose. This is because glucose is metabolized by every cell in the body, and fructose must be metabolized by the liver. 3 Tests on animals show that the livers of animals fed large amounts of fructose develop fatty deposits and cirrohosis of the liver. This is similar to the livers of alcoholics. "Pure" isolated fructose contains no enzymes, vitamins or minerals and may ROB the BODY of these nutrients in order to assimilate itself for physiological use. Fructose can contribute to diabetic conditions. It reduces the sensitivity of insulin receptors. Insulin receptors are the way glucose enters a cell to be metabolized. Significant increase in uric acid; increased uric acid can be an indicator of heart disease. Increase blood lactic acid, especially for people with conditions such as diabetes. Extreme elevations may cause metabolic acidosis. Leads to mineral losses, especially excretions of iron, magnesium, calcium and zinc compared to subjects fed sucrose. RAPID accelerated AGING through oxidative damage. Scientists found that rats given fructose had more cross-linking changes in the collagen of their skin than other groups fed glucose. These changes are markers for aging. Make you fat! It is metabolized by the liver and converts to fat more easily than any other sugar. Raises serum triglycerides (blood fats) significantly. Fruits contain a much smaller amount of fructose compared to sucrose and glucose. In addition, fruits contain vitamins, minerals, phytonutrients, fiber, and other nutrients. Our bodies are designed to digest a complete "package" of nutrition that appears in whole, fresh, ripe fruits. Could nature be wrong? Eat fruits whole or blend them Do NOT JUICE FRUITS. When you juice fruits you remove the fiber which helps to slow down the absorption of the sugars. Concentrated sweeteners i.e. DRIED FRUITS also contain no fiber and have much greater concentrations of simple sugars than are found in fresh fruit or even juices,, plus they may cause constipation. Now that you have a better understanding about Agave Syrup, hopefully the companies selling "raw" agave won't dupe you. They are out to make a buck, which in this case is unfortunately at the expense of your health.